Character Connection is a weekly featured hosted by Jen of The Introverted Reader. Click the picture to learn more about it! As you’ve all heard me mention a few times, the Harry Potter books by J.K. Rowling is one of my all time favorite series, and one of the reasons for this is because I grew up with these books. I remember in sixth grade when my book club decided to read these book I convinced my parents to obtain hardcovers of the first three books for me (because only the first was out in paperback, and they had to match). I quickly fell in love with the entire series. I love many of the characters dearly, so today I’m going to post about one of the characters that reminds me a bit of myself: Hermione Granger. Unlike Hermione, I am not a ridiculously talented witch. I’m not a witch at all, really, although after reading Matilda I attempted to channel my telekinetic powers. Yet as talented as Hermione is with her wand, she has more trouble socially, which I can relate to. She sometimes alienates people by being a bit of a know it all and very bookish, and when I rode the bus home with my brand new Harry Potter books balanced atop my alto saxophone, people thought that I was a.) really smart and b.) really nerdy (I definitely am the latter, and the former shall be left to your imaginations). Naturally, Hermione developed and grew throughout the series, as we all do eventually, and I loved watching her mature. I particularly liked that she formed the group S.Society for the Promotion of Elfish Welfare, also known as S.P.E.W. in support of the rights of house elves. I think it’s so awesome that she stood up for what she believed in even when her friends and classmates ridiculed her. Since these books were made into movies so soon after their publication, when I think of Hermione, I think of Emma Watson, the actress who plays her. I think she brings a perfect balance of emotion and wit to the role. I hope and think that the characters of Harry Potter will be remembered and loved by readers even though there won’t be any more books in the series. Even though she’s a witch, I think Hermione will be popular with nerdy girls because she’s so relatable. I love this and I love this series too! I agree with the Emma Watson. I think she's a very talented actress. Great post! 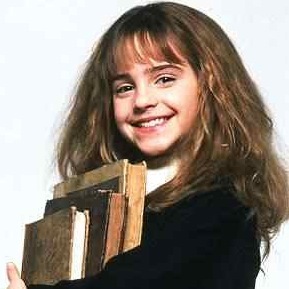 Part of the reason I love Hermione is because of the frizzy hair. It's generally okay now, but when I was her age, it was out if control! I definitely tend to be the nerdy one, and while I don't think I come across as a know-it-all, I'm so quiet I sometimes come across as stuck up. I guess that's my brand of social ineptness (ineptitude? Too lazy to check). I do love Hermione.